Hercules star Kevin Sorbo's political and religious views have caused him no small amount of grief on the internet over the past couple of years, but there was a time when he was just a gorgeous, golden-haired hunk of burning love playing a Greek demigod on syndicated television. Next month he'll return to that role, sort of, as the voice of the same hero in the gods-brawling MOBA Smite. 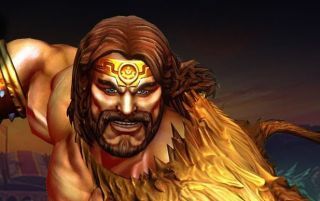 The voice pack, along with the Hercules character and the "Retrocles" skin—that is, the original, bearded Hercules—will be available for free to anyone who wins ten PvP matches in August, to celebrate Smite recently passing the ten million user milestone. They will also presumably be put up for sale, for the benefit of gamers with more money than mad Smite skillz. Hi-Rez also announced that it will reveal a new game next month at Gamescom, which runs from August 5-9 in Cologne, Germany. The studio offered no details about what's coming but the game will be playable at the show, and Hi-Rez co-founder and Chief Operating Office Todd Harris said on Twitter that it is being developed for both PC and consoles.